Good day! Thanks for having me. May I request prayer here? You can put it in the Prayer Requests forum. Welcome to CC. A warm welcome to CC and glad you are here. 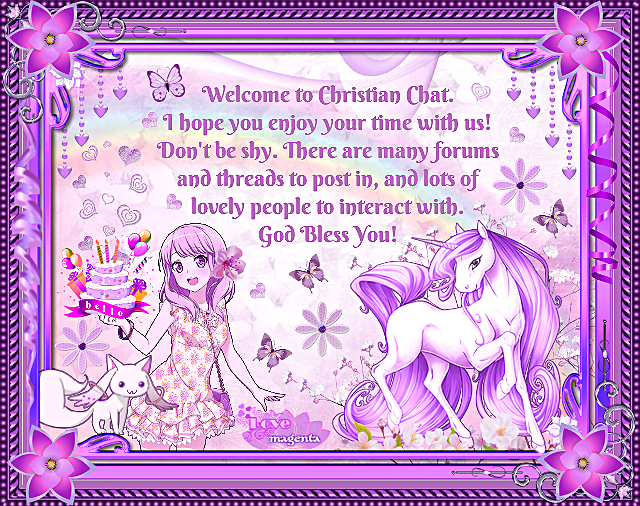 Have fun looking around here and plz post your prayer req in that forum & we will pray w/you. God bless! Here please read this. I am 54 yrs. old and ex drug addict. Lost my significant other 2012. Lost faith in GOD after that. Still yet have not been on a true and honest chat site. Sure, you can request a prayer here or create a thread in the Prayer Request Forum. It is great to have you onboard with us. Welcome to CC. I have been a member almost 5 years and this site has been a tremendous blessing to me. I lost my significant other in 2014 but have since remarried. It may be helpful to you to create your own thread in the Prayer Request Forum or Testimonies. Just click on Christian Forums at the top of the page. It will list the forums. Click on the forum you chose on the link on the left-hand side. It is easy to do and it will be quite clear on how to submit a thread. I am sorry about your loss and hope that you find comfort, support and understanding here. I am glad to have you as part of our family. Welcome to CC. TY Not sure what 2 say but still hurt. Have no significant other and surrounded by 4 walls when get off work even though i have family members still living. No 1 2 go home to. Actually you're new to the forums. The chats are separate and require an app to download. We do have a Prayer Request forum which may be better suited for asking for prayer though. Perhaps create your own thread on it, not using another's thread. We have a Singles forum that would be fitting for such a thread. Hello and welcome to CC, friend. please feel free to share in the "Prayer Requests" section. I hope you find this forum helpful and encouraging. Grace and peace to you. Welcome to CC ! You never go anywhere alone. I'm so sorry for your loss. Seek Christ for comfort. Wonderful thing is he is always there. God bless. Hello Saul2Paul, welcome to CC. I hope you will enjoy your stay here. Hello Want2luv, welcome to CC. I hope you will enjoy your stay here. Welcome brother, of course you can request prayer! See you around, blessings in Jesus Name!